The Helmerich Research Center (HRC) is a state-of-the-art research, development, testing and education center located on the OSU-Tulsa campus near downtown Tulsa. It was created to fulfill the commitment made to the citizens of Tulsa for Vision 2025. 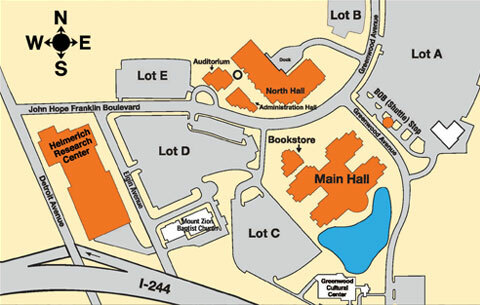 The HRC, also home to the OSU School of Materials Science and Engineering (MSE), contains laboratories, conference and meeting rooms, and faculty and staff offices. Faculty from mechanical engineering, electrical engineering and materials science and engineering work collaboratively on research and graduate education. The HRC places the OSU College of Engineering, Architecture and Technology in a unique position to conduct world-class education, research and technology development and transfer in advanced materials of strategic importance to our nation. The mission of Helmerich Research Center is focused on providing research, testing, technology transfer and education to advance the region's aerospace, energy, manufacturing, transportation, electronics and medical industries. Research at the HRC has a positive impact on the economy and quality of life for the region and provides opportunities for OSU students and faculty to work hand-in-hand with industries. Tulsa-based industry leaders also identified "materials" as the "core" discipline at the HRC. We have outstanding faculty, students, research facilities for advanced characterization of materials, and dedicated staff to help you achieve your goals as you interact with our center and us. Access to the Helmerich Research Center is restricted to approved members of the university community. Each approved member of the OSU community must use their OSU ID to gain access to the building and prominently display a university ID badge. The Helmerich Research Center is staffed by a receptionist between 8 a.m. and 5 p.m. Monday through Friday. However, the facility will be locked 24/7. Those who have received card access must use their access card to gain entry to the facility. Although approved students, faculty and staff can gain entry, individuals are cautioned against permitting strangers to enter the buildings and are urged to require individuals seeking entry to use their access cards.